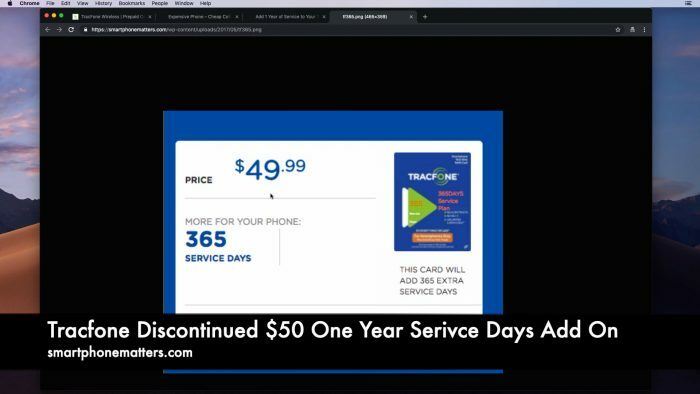 In January 2019 I heave from a few of my readers that they no longer buy the $50 Tracfone One Year (365 days) Service. I added one to my account last September and so I know it was still available last September. so I checked both the my account of tracfone.com and in Tracfone’s My Account App on my phone and yes indeed the option was no longer there. * I finished the checkout. * My account page shows my last day of service extended for a year. Thanks for the help. Hope this is helpful to others. Thank you for sharing. Apparently some of us have lost this option, while others still have it. I am glad you were able to add service days, that was / is one of the best deals tracfone has. This just worked for my sister, who has an LG Android with Tracfone. Like everyone here, she has LOTS of “time” left, but is running out of service days. In the past, we have always been able to purchase 365 extra service days for $49.99. Today, we were able to add a plan card to the cart, then the extra service days showed up. We added that as an option to the cart, deleted the plan she selected originally, and voila! She now has 365 extra service days for $49.99 plus tax. Unfortunately for me, I switched over to my daughter’s old AT&T iphone, and I am NOT able to get these extra service days on my phone, which is a shame, as I also have LOTS of minutes/text/data left and only need extra service days. Bummer. Thank you to everyone for the information!! Glad to hear it still works for your sister. Seems like it still works for basic phones and their low cost Android phones. I really miss that add-on a great way to use up minutes or my fav was to keep a smartphone active when it doesn’t get used to often. I used this service for the past few years. Now I’m not sure what options I have left. I did buy time but didn’t get the option for the 365 days of service. Some readers have reported they still have the option. It appears it may still be available for basic phones and a selected set of low cost Tracfone smartphones. I checked three different phones I had set up, all BYOP smartphones none had the option any longer. Now instead of spending $50 per year to use up the remaining minutes you’ll need to pay $125 for more minutes and a year of service days. Very disappointing. I’m still looking for a way to see if I can get the option back. it shows available in mine just like last year, on 2/25/19. put the cheapest card in then it showed below. i added it and removed the cheap card. done. Great. The option was missing on three different accounts I manage. All had the option previously. Others reported it missing too. But, I’m hearing from other like yourself that still hsve the option. Best I can tell customers with BYOP smartphones lost the option, customers with basic phones and select android phones purchased from tracfone still have the option. Thank you for sharing. May I ask what type of phone you have? Thanks to the tips here, I picked the lowest plan available for my fone, the 30/30 plan, and at check out I was able to add 1 year service days for $50. After adding that, I was then able to deleted the 30/30 plan that got me to the check out page. So I was able to get the 1 year additional service for just the $50 with no added taxes or fees. This is great for me since I still have 2851 minutes in the bank already. The last time I did this, I bought a whole year of service with minutes and also added an additional 365 days, so I was paid off for two years. But that didn’t really make sense given that I already had plenty of minutes. Just adding service days like this is good deal. That’s just $4 a month for mobile phone service! It will take me forever to burn up 2.8k minutes. Glad to hear you were able to add the one year of service. I wish it were still available for me. Bummer. So it must be because I am still using an ancient flip phone which is grandfathered in some way. I’ll keep this possibility in mind before considering an upgrade. It would be nice to know for sure what determines the availability of this buying option. It has been suggested that it still works for older basic phone and a few of the least expensive smartphones they sell that use an older version of android. If you decide to update your phone consider adding an extra year or two before upgrading. The balance will carrier over. Thanks for posting this. That’s a bummer. Too bad I didn’t renew it back in December, but who knew? I appreciate knowing that it’s not just that I couldn’t find that item on the Tracfone site. Yea. I miss this option. Apparently some people with basic Tracfone phones still are able to get this add on. I also just tried to add it for my son’s smartphone. Although it was not an option, I chose the lowest service card available and then upon check-out, I was allowed to also purchase the $49 card, which added 365 days in addition to the 30 days. So, 395 service days, 1gb data, 1000 texts for $75 with all fees. Cool. Thanks for taking the time to comment and share that. I no longer have any tracfone phone active so I can’t see that from my account.